Discover the newest tasty, wholesome snack - one that both moms and kids can happily agree on - available now in the dairy case! We love Go-Gurt around here. You'll probably find an empty tube or two in the back seat of my car somewhere! And now that they are made with pure & simple ingredients, I'll feel even better about picking up Go-Gurt for an on the go snack. This prize pack is really fun. The Etch a Sketch, well you know that's fun and the weekly planner is so cute. I haven't gotten a chance to use the back seat organizer, but I'm sure it will come in handy! 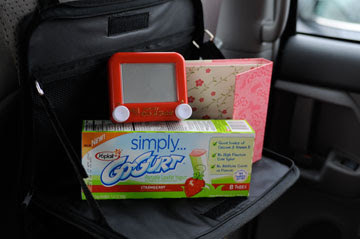 One lucky winner will receive a Simply Go-gurt prize pack that includes- a coupon for a free sample of Simply... Go-Gurt* as well as a Go-Gurt "Simplify Your Life" prize pack that includes a pocket Etch a Sketch, weekly planner and a seat back organizer. - That's 12possible entries with a chance for unlimited possible entry points!! Disclaimer: My Blog Spark provided me with a review sample and the same for one winner. These views are my own. My kids like packs of raisins as a snack when they're on the go. I follow you on networked blogs with my FB name Mary Happymommmy. Carrot sticks are great because they don't spill and they aren't messy! My kids like granola bars. Dried fruit is always a winner with us! My daughters love to eat carrots with ranch dressing as a dip. Thanks! String Cheese is a big hit for my girls. We have raisins and graham crackers for to go snacks. I follow you and tweeted #1. I follow you and tweeted #2. I give my kids walnuts and chocolate chips in a little kid sized bowl, they love it! My son loves string cheese...and it's great on the go! My kids love string cheese! Our favorite healthy on-the-go snack is trail mix :) *Thanks* for the giveaway! We love banana bread bran bites because they taste great, are high in fibre and low in calories and they taste great! I always keep little bags of pretzels around the house for on the go. Easy and pretty healthy! I like to feed my kids dried fruit (dried pineapple is so good!!!) when we are on the go.